Vasili Firsau won the $3,000 buy-in (Six-Handed) Pot-Limit Omaha championship, which was played out and completed today at the Rio in Las Vegas as part of the 2015 World Series of Poker. His victory marks yet another poker triumph by a player from the Eastern Bloc, which is producing extraordinary talent and even more challenges for players elsewhere around the world. Firsau is only the second gold bracelet winner in history from the nation of Belarus. With this victory, the Minsk poker pro joins fellow countryman Alex Bolotin (now residing in the U.S.) who won the $1,500 No Limit Hold'em Shootout at last year’s WSOP. In fact, two of the top five finishers were from the Eastern European nation of Belarus, which is the first time this has happened at the WSOP. Vasili Firsau was the 1st place finisher and Vadzim Markushevski came in 5th. The latest champion outlasted a tough field of 682 players. The tournament took four lengthy days and nights to complete, as an added playing session was necessary since a lengthy stalemate at one point pushed the action into overtime, and then some. The turning point came when play was four-handed and action hit a wall. After a flurry of eliminations at the start of the third day, play slowed to a crawl as players jockeyed for position heading into the tourney’s more lucrative and pressure-filled homestretch. Four-handed play lasted for 6 hours (5 hours towards the tail end of Day Three, and 1 hour into Day Four). Once Numit Agrawal, from West Lafayette, IN was eliminated in 4th place, that set off yet another impasse and swirl of chip redistribution. Andreas Freund seemed to have control of the final table at least a few times as the chip leader at various points. However, he couldn’t maintain his edge and finished in third place. Freund hoped to become the second winner in as many days from Vienna, Austria following Adrian Apmann’s victory the previous day in the Extended Play tournament. However, Freund ended up going out two places shy of the win. The heads-up duel between Nipun Java and Vasili Firsau lasted for over an hour. 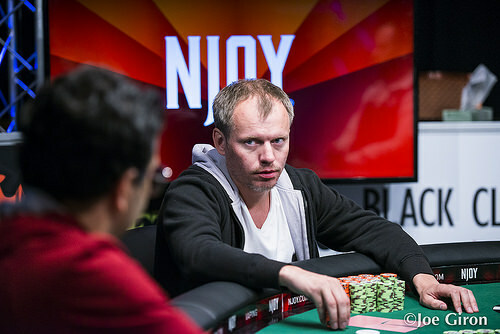 The Belarus player started the duel behind in chips, but slowly reversed the scales, eventually defeating Java heads up. For finishing second, Nipun Java, from Northridge, CA collected $270,509. This was his best WSOP showing to date, at least financially speaking. Java won a WSOP Circuit gold ring two years ago at the annual stop held at the Bicycle Casino in Los Angeles. This was his 10th time to cash at the series. Also of note was Daniel Idema’s 6th-place finish. The Vancouver poker pro was hoping to become the third dual gold bracelet winner of this year’s series, following double wins by Brian Hastings and Max Pescatori. However, Idema wasn’t able to get deep enough to challenge for the chip lead. The latest gold bracelet champion is an unlikely winner, given his previous disappointments at the WSOP. This marked the sixth year Firsau has attended the annual summer classic in Las Vegas. Incredibly, he failed to cash until this year. Firsau now has three WSOP cashes, both which took place in 2015. Earlier, he min-cashed in the $1,500 buy-in Limit Hold’em event. The top 78 finishers collected prize money from a pool totaling $1,861,860. Firsau took the lion’s share of the purse, which amounted to $437,575 for first place. Firsau also received the game’s most coveted prize – the famed WSOP gold bracelet. This marked his first win and a personal career milestone. Second Place: Nipun Java came close to what would have been a first WSOP victory, but he could not maintain his heads-up chip lead and fell just short. Still, his consolation prize amounted to $270,509. This was his tenth occasion to cash at the WSOP. He also has seven cashes on the WSOP Circuit, including a win. Prior to playing poker full time, Java was a software engineer. Third Place: This was the first WSOP in-the-money finish for Andreas Freund, from Vienna, Austria. He collected $171,626 in an amazing debut effort. Fourth Place: Numit Agrawal, from Indiana, made his second career final table at the WSOP, which paid $112,717. He finished 5th in the $10K buy-in in 2013. This was his fifth time to cash overall at the series. Fifth Place: Vadzim Markushevski was the second player from Belarus who made this final table. 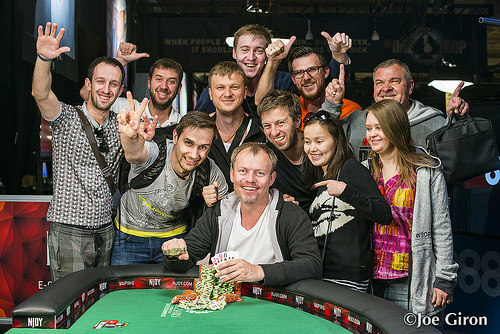 The former economist from Minsk cashed for the fifth time at the series. He collected $76,373, which was his biggest win here, to date. Sixth Place: Daniel Idema’s bid for a second gold bracelet this week fell short as he took 6th place in this event. The Vancouver, BC (Canada)-based poker pro was hoping for a fourth career victory, after posting wins in 2011, 2013, and 2015. However, he came to the final table short on chips and busted only about an hour into the session. Idema now has 26 WSOP cashes and nearly $1.4 million in career earnings after collecting $53,342 for this effort. Seventh Place: David Tuthill, from St. Petersburg, FL rounded out the final table as the 7th-place finisher. He collected $38,384. Tuthill won the WSOP Circuit championship event at Caesars Palace Las Vegas in 2012. He now has two WSOP final table appearances, and more than $600,000 in career earnings between both gold ring and gold bracelet events. Aside from the final table finishers, other gold bracelet winning players who cashed included – Robert Mizrachi (21st), Erick Lindgren (39th), and Joe Hachem (68th). The gender breakdown of players in this event was 664 males and 18 females. The average age was 35 years, with the youngest player being 21 and oldest at 85. There were 45 different nations represented in the field. Nipun Java raises to 600,000 from the button, and Vasili Firsau raises the pot. Java calls all in, and the players turn up their cards. The board comes . Vasili Firsau makes a full house to win the pot, and immediately runs to celebrate with his rail. Nipun Java is eliminated in 2nd place. He earns $270,509. Vasili Firsau becomes the latest WSOP bracelet winner, and he wins the first-place prize of $437,575. 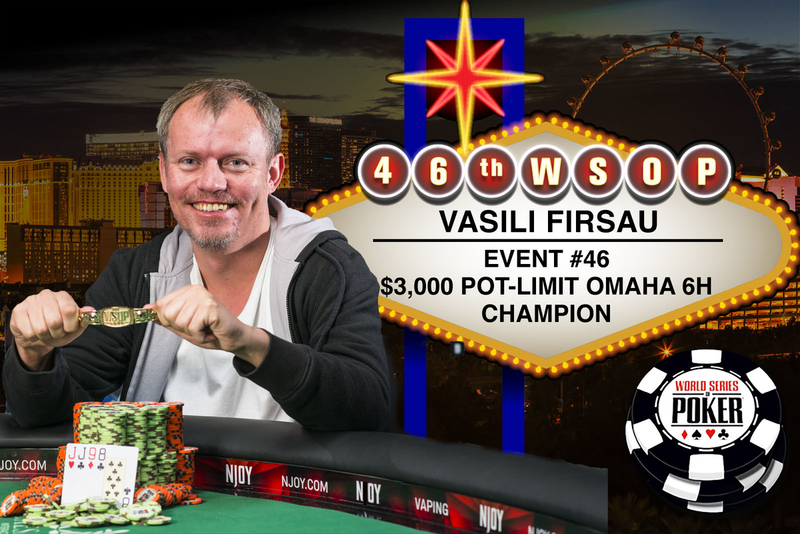 Vasili Firsau raises to 600,000 from the button, and Nipun Java folds. Vasili Firsau gets a walk. Vasili Firsau calls on the button, Nipun Java raises to 600,000 and Firsau folds. Nipun Java raises 500,000 on the button and wins the big blind. Nipun Java gets a walk in the big blind. Nipun Java limps in and Vasili Firsau raises pot to 600,000. Java folds and Firsau wins the hand. Vasili Firsau and Nipun Java are on a quick break, back in 10 minutes. Vasili Firsau calls from the button and Nipun Java checks his big blind. Java bets 300,000 on the flop. Firsau calls and they see a turn. Java checks, Firsau bets 730,000 and wins the pot after a fold from Java. Vasili Firsau raises to 350,000 from the button, and Nipun Java calls from the big blind. The flop is , and both players check. The turn is the , and Java leads out for 350,000. Firsau calls, and the river is the . Java checks, and Firsau bets 805,000. Java shakes his head and says, "That was a bad river card for me." After thinking for a minute, he folds, showing only two of his hole card face up: . Firsau jokingly asks the dealer to switch the river card, and shows for a better full house than Java. Nipun Java raises 320,000 on the button, and Vasili Firsau defends his big blind. Firsau checks on the flop. Java bets 300,000, and Firsau calls. Both players check the turn. Firsau takes chips on the river and that's enough to win the hand, Java folds. Vasili Firsau limps in from the button and Nipun Java checks in the big blind. Both players check on the flop, the turn and the river. Java shows and wins the pot. Nipun Java limps from the button, and Vasili Firsau makes a pot-sized raise to 480,000. Java calls, and the flop is . Firsau continues for 805,000, and Java quickly folds. Nipun Java gets a walk. Nipun Java raises to 320,000 from the button, and Vasili Firsau calls. Both players check all three streets and the board comes . Java shows , and he wins the pot with his two pair. Vasili Firsau limps in and Nipun Java checks his option. Java check on the flop. Firsau bets 230,000 and Java folds. Nipun Java raises to 320,000 on the button. Vasili Firsau three-bets to 960,000 and Java folds.